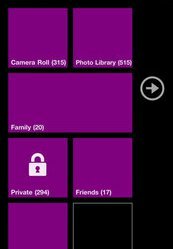 Pics App By Phyar Studio is one App which deals with all your photo/video management for iPhone / iPodtouch / iPad that is based on the Windows Phone 7 Metro theming system. Pics was earlier named as SeeSee which was later named more apt to Pics. This App allows you to do many interesting and Useful things with your photos and Videos which you always thought would be helpfull if present in your iPhone, it allows you to Manage your photos and arrange them in groups and folders and also gives the option of Password protecting your secret Folders, this also allows you to view photos present in your Mac or PC directly in your iPhone/iPod touch/iPad wiht the use of Wifi or 3G. These were just some of the main attractive features which i mentioned here below you can see the full list of Features available in the awesome App. Add, delete, order albums, edit album name and properties. Move, delete photos and videos. Progress indicator displayed on your device while uploading. Photos and videos can be displayed directly in your web browser, and all the changes made on your device would update to web browser automatically. Transfer photos/videos to another iPhone/iPod touch/iPad with WiFi or Bluetooth connection. AlbumSync with p2p transfer. Compare albums on two different devices and send photos not exist in remote album by one tap. if album not exist, Pics would create a new album on remote device to receive all photos. View all albums synced by iTunes. Amazing animated 3D user interface to give you the best appearance and changing your iphone photos and Videos album. To connect with your Mac you need to download “Pics Assistant” from the Mac App Store.